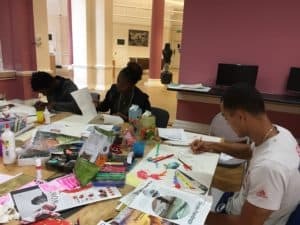 The past week we have been running a series of ZINE workshops with residents of Evolve Housing‘s Stockwell hostel. It is always a bit of a stress, not knowing if the project is going to appeal or, worse still, whether anyone is going to turn up and actually do anything. Well, the fears didn’t last long, every day people would turn up, sit round a shared table, talk and share insights, stories and their creativity with each other. It became a very meaningful activity, trust was developed and creative content was produced for the DECAY zine which was beautiful, emotional, personal and incredible. 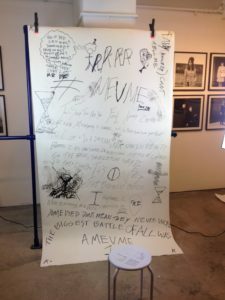 They produced drawings, illustrations, poems, photographs, stories and collages and it will now be a hard task to edit, select and curate these for Issue 2 of the Accumulate DECAY zine. 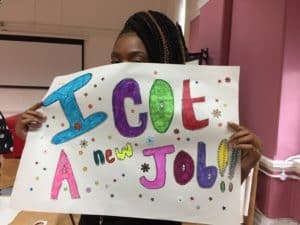 Tonya came to the DECAY workshop after getting a new job, and she created this lovely poster which just sums up how great she felt! We finished the week of with a portrait and drawing workshop at Youth Subculture. The group created their own backdrops and then had their portraits taken in front of their creative work. 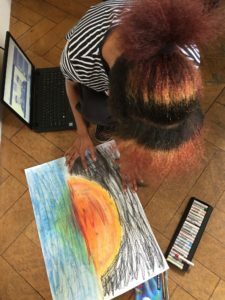 It was a very empowering session, in fact the whole project has really encapsulated what Accumulate is all about – using creativity as a tool for empowerment and progressing in life. DECAY will come out in September, so be sure to grab a copy and find out just how much talent there is, that is hidden, and just needs a helping hand to be enjoyed, appreciated and admired. It’s going to be great!